Sometimes I forget that an intoxicating eat can simply be a soup with a layer of flavor added in from some wine. A simple extra step of roasting the vegetables adds so much. And roasted garlic? Preheat oven to 400 degrees. Chop cauliflower into florets and slice mushrooms. Lay out on a baking sheet and toss with a drizzle of olive oil, salt and pepper. 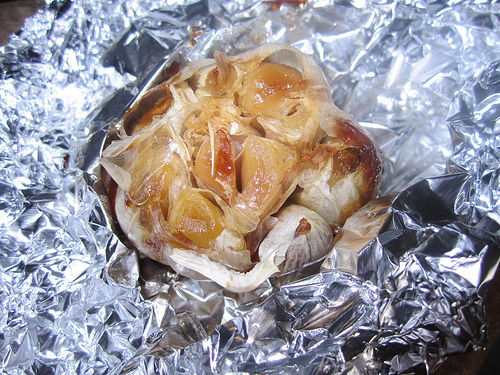 Cut the very top of the garlic bulb off to expose the cloves, drizzle with olive oil and wrap up in aluminum foil. Roast everything for about 30 minutes. Dice carrot and onion over medium heat in a soup pot . [You certainly could roast the carrot and onion for a fully roasted vegetable soup!] After the vegetables have softened, add flour and cook for a couple minutes. Add salt, pepper, and thyme. Add 1/4 cup of the wine to deglaze the pan, then add the remainder of the wine and broth and bring to a boil. Squeeze in the roasted garlic cloves and add the cauliflower and half of the mushrooms. Bring to a boil andl cook about 10 minutes, making sure the stalks are completely fork-tender. Take it off the heat and stir in that splash of cream. 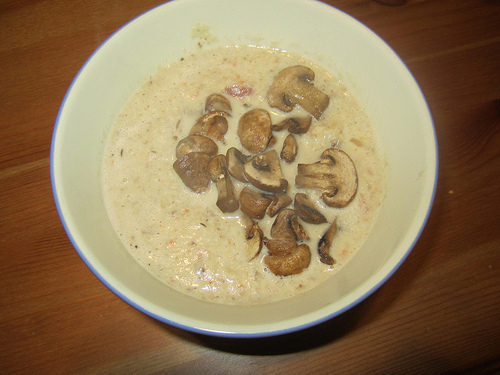 Puree and enjoy with the remainder of the mushrooms as garnish! 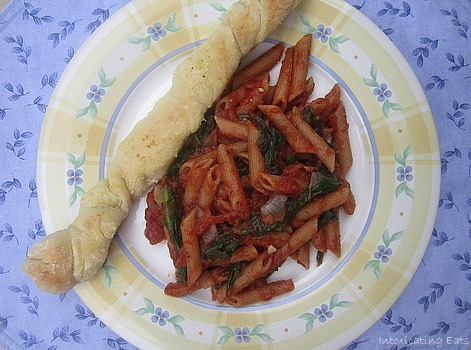 Pasta cooked in wine instead of water? Genius. Pure genius. Look at the beautiful color in that pot! We used cabernet sauvignon, but any dry red will do. Just DON’T use “cooking wine.” (What is that stuff??) One of the glorious things about this method is that you don’t need a substantial sauce-all that cabsav flavor is cooked into the pasta itself! Reinforce that flavor by using some of the cooking water. 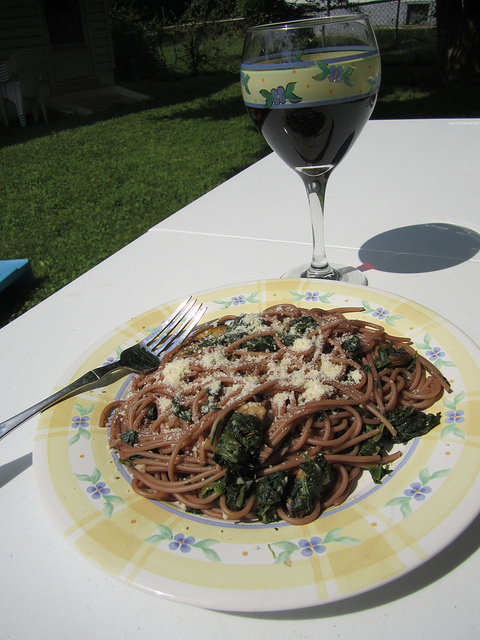 I chose to pair my pasta with mushrooms and spinach because they can soak up more of that wonderful wine. Of course, I also recommend buying one of the larger bottles of wine, only using 3 cups in the cooking process, and enjoying a glass along with dinner. Or while you cook. Or both. With this method you end up with a deep yet subtle wine flavor that permeates the entire dish. And it’s a pretty color. Now, the real question is–what liquid will I cook my pasta in next…? Pour wine into pot and supplement with water. 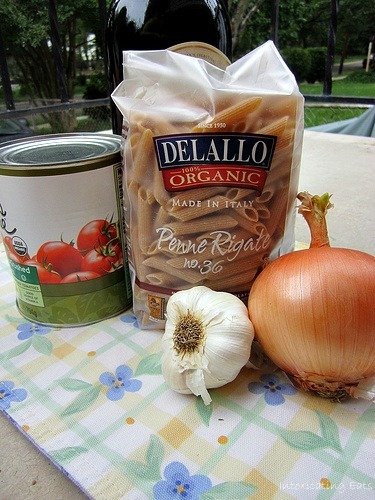 Bring to a boil for the pasta and cook according to package directions and drain. RESERVE SOME PASTA WATER. Defrost spinach in the microwave and squeeze out the liquid. Preheat a skillet big enough for the pasta (we’ll be adding it in later) over medium heat. Saute mushrooms in some olive oil. Add chopped garlic cloves, salt, pepper, and the cracked red pepper. 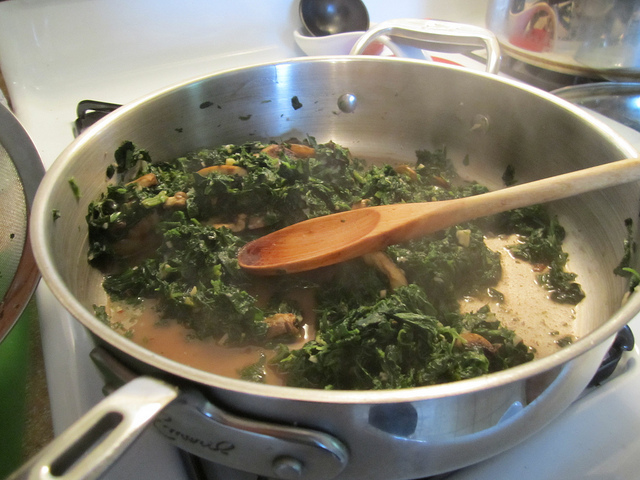 Add the spinach and heat through. 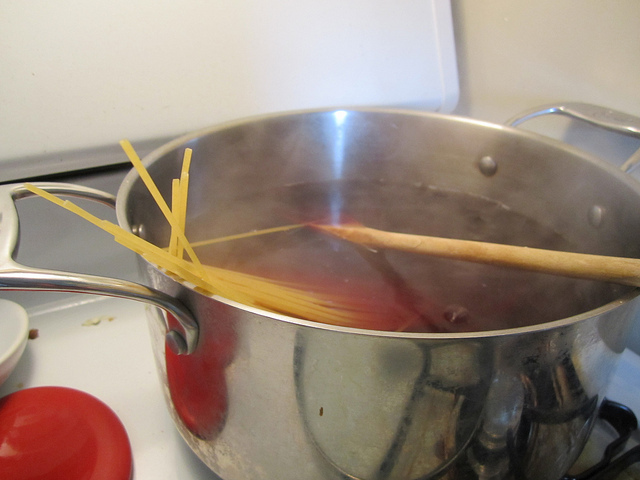 Add some reserved pasta water to create a sauce for the pasta, about a cup. Toss in the pasta and add more reserved water if needed. Adjust seasoning if necessary. 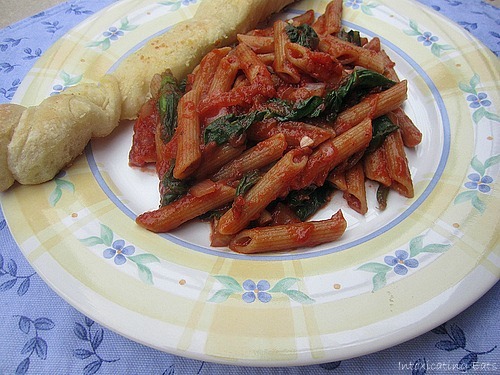 Plate and sprinkle on parmesan cheese.